Slow roasted, a grape tomato becomes a wonderful thing. My technique is to halve them, place them cut-side up on a parchment-lined baking sheet, and drizzle them with olive oil and kosher salt. 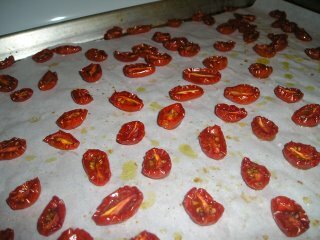 Then I slow roast them in a 250 oven for 2-3 hours, until they look all shrively, like this. Let them cool and then eat them on a salad, in a pasta or just out-of-hand, like me. They turn as sweet as candy and they're delicious. If I make them for a recipe, I need to careful about snacking on them because it is so easy to eat them all. By the way, cooked tomatoes are better for you than raw. So when those summer tomatoes come in, try my method. Yes! I've been roasting tomatoes lately too. I did mine at 200 degrees F for about TEN hours, and they were great. I did eat most of them as-was, but some made it into the sauce around a braised beef roast and man was that good.